If you have a secret, and someone threatens to reveal it, would it feel "like the world was closing in"? Lori Rader-Day, award-winning author of The Black Hour and Little Pretty Things, takes readers into the life of a flawed, determined character in The Day I Died. It's a story and character that won't easily be forgotten. Anna Winger and her son, Joshua, have been on the run for thirteen years. As a handwriting analyst, she can work and communicate with her government contact from any location. Whenever she feels threatened, she picks up and moves. Did someone recognize her in Chicago? Move on. But, it's in a small town, Parks, Indiana, where everything falls apart. As a favor for her boss, Anna agrees to look at a couple notes when a toddler disappears. Sheriff Russ Keller is skeptical. Handwriting analysis is a little too woo-woo for him. But, the town is on high alert, the mother has disappeared, and the media is all over the case. When the nanny is found murdered, Keller admits he'll take any assistance to find the missing child. Anna realizes she's more interested than she should be, but she identifies with the runaway mother. She's been protecting her son for his entire life. Now, at thirteen, Joshua is rebellious and questioning. When he, too, goes missing, Anna can no longer hide from her past. No review of Rader-Day's powerful standalone is going to do it justice. There is so much that can't be said. From the gripping opening to the satisfying conclusion that offers closure, there's no wrong step in the story. Anna Winger sees herself only as a mother trying to protect her son. Is she a reliable narrator? Can the reader trust a character who has been running for years? What is the truth when Anna introduces the story by telling about "the day I died"? She's a character that never doubted what she was doing was right, until the day her son disappears. Then, her determination to find him leads her to find unknown strength. Powerful. Intense. This intricately plotted story, and Anna Winger, are unforgettable. 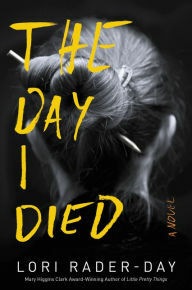 Lori Rader-Day's The Day I Died is one of the best books I've read this year. The Day I Died by Lori Rader-Day. William Morrow. 2017. ISBN 9780062560292 (paperback), 432p. FTC Full Disclosure - The author gave me a copy of the book, hoping I would review it. Another review that gets me excited about a new book! I'll be ordering this one, for sure. It's wonderful, Reine, not at all what I expected. So much more than I expected! okay - I'm sold. Off to order this. When you say "so much more than I expected" I know it's got to be special. Kaye, I looked at the book & expected another woman in jeopardy book, which I'm not fond of. That's the reason I put off reading the book. Not at all what I expected. Lesa, you must be reading my mind. I'm not a fan of women in jeopardy either. OR children in jeopardy, so I probably would not have picked this up without your recommendation.